A bird in the hand reveals information and provides insight that would be impossible to obtain in the field, even when using the best modern day optics. After reading enough measurements and averages in "Gulls of North America, Europe, and Asia" by Klaus Malling Olsen and Hans Larsson, I decided I would try to gain access to the gull skins at the Field Museum. I contacted David Willard from the avian division at the museum and he was very welcoming. I extended an invitiation to several birders and met with Steve Ambrose, Sam Burckhardt, Tom Lally and Walter Marcisz on the morning of 7 March, 2010. I had several objectives in mind which included a hands-on approach of comparing mantle shades, bill size and shape, and overall structure. I guess you could say this visit was very informal and more play than anything else. The first thing I did was get my hands on a Pacific Gull (L.pacificus). This gull is known to some as Large-billed Gull or the Australian Gull. It's range is strictly along parts of Australia's coast. A couple of interesting tidbits about this species is one, it has salt glands which help reduce the amount of salt in the bloodstream, and two, it has the thickest bill of all gull species. It's hard to appreciate this almost comical looking bill without the enitre bird. Compared to other gulls, the bill looks completely disproportionate. Walt Disney's animation movie "Finding Nemo" tried to do depict this bird since the movie was based around Sydney, Australia. The bill shape is greatly corrupted in this picture below and the mantle color is significantly lighter than it should be - but my children never knew the difference! 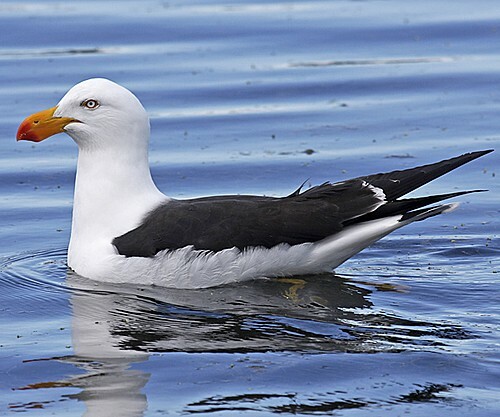 Pacific Gull's mantle color is much closer to the widely scattered Kelp Gull (L.dominacanus) of the southern hemisphere. It's interesting to know that PAGU has been driven out of much of its range surrounding the Sydney area due to the Kelp Gull. Another interesting moment during our visit was this oversized Glaucous Gull that was much more goose-like than gull-like. Sam Burckhardt showing off this mega-gull. Adult Little Gull, juvenile Little Gull, Heermann's Gull chick, Herring, Slaty-backed, Great Black-backed, Glaucous Gull. This shot speaks to how big GBBG is -- or is it a testimony to how small LIGU is? One can easily imagine how a GBBG can down a Dovekie for lunch. Franklin's left, Laughing right; note how the bill color here is not representative of Franklin's and Laughing's true premorteum colors. Dwight made mentiond of this in his Gulls of the World: "Yellow seems to be a color that persists in old skins, all the others fading out, although some reds last very long". The CAGU should be quite obvious based on mantle color; This is not always so in the field. For what it's worth, the BOU feels Thayer's Gull is a subspecies of Iceland Gull. This opinion is adopted by many Canadian ornithologists as well. Thayer's remains one of the greatest controversies in larophilia and it doesn't look like this taxon will be resolved any time soon. At the end of my visit, I was left with many more questions than I had before coming to the museum. I've definitely gained a greater appreciation for the work ornithologists do! This is a very interesting article on gulls. 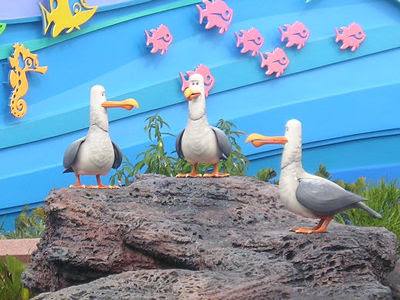 I have watched Finding Nemo and I never noticed the Guls in the movie too lol. Good job though.